Sometimes a flawed diamond can sparkle and shine brighter than a polished one. Raazi is that triumphant film which leaves you with some serious misgivings. The story, as we all know by now, is based on the real events during the eve of the 1971 Indo-Pak war when a valorous young Muslim Indian girl Sehmat decided to cross the border to become wife in a Pakistani family of armymen to gather information for the Indian government. In Talvar it was the family honour at stake. In Raazi, it is “country”. “Mulk se aage kuch bhi nahin,” is said in various permutations and combinations. And you feel, Sehmat (played with an intuitive rather than an intellectual brilliance by Alia Bhatt) is trying more to convince herself than others around her. 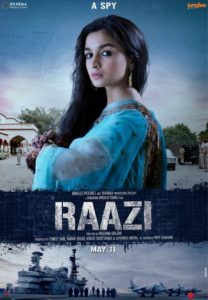 Raazi is film that gives us a true female hero of her times, and our times. Sehmat puts family, personal happiness and inter-personal relations behind her country and lets the mulk…sorry milk of human kindness flow into the spirit of nationalism. But the same dedicated fiercely patriotic child-woman happily betrays the people who trust her, take her in as the daughter-in-law of their family in spite of her being from the hostile country. Can a woman who betrays those who trust her blindly, really protect her country? Apparently she can. And this courageous but misguided woman did exactly that. I don’t know how much of the film actually happened in the real Sehmat’s life. But what transpires in the film is pretty much improbable, if not altogether bizarre, as one after the other Sehmat the Indian spy compromise the role of Sehmat the Pakistani Bahu. Bravely, director Meghna Gulzar and her co-writer Bhavani Iyer refuse to demonize the enemy. This is at once the film’s biggest strength and its greatest failure. For, in humanizing the Pakistani family of Sehmat’s husband Iqbal (played with unnerving quietude by Vickey Kaushal) the narrative takes the risk of seriously weakening the female hero’s patriotic fervor. Many times I was horrified by Sehmat’s abuse of her in-laws’ hospitality and trust. The easy way would have been to simply show the Pakistani household as a villainous den of radical fanatics. But Sehmat’s in-laws and specially husband are suave, gentle educated cultured people. This adds to Sahmat’s dilemma of the conscience—a dilemma that neither Sehmat not the film is fully able to resolve even till the end. Alia Bhatt lets her performance merge in Sehmat’s moral dilemma. We often see her break down in private. But her grief earns no sympathy from us. Her imagined moral high-ground is not only patronizing to the people whom she betrays it is also unconvincing to us who watch in horrified silence as she murders and double-deals with a defiant impunity. Speaking of silence there is plenty of it in the storytelling. Meghna Gulzar basks in the quietude that underscores the turmoil of a soul tormented by the guilt of her betrayal. The most memorable moments in the film are those between Indian Wife and Pakistani Husband, played with an empathy and wisdom by the two leads actors that the script doesn’t always support. The supporting cast specially Rajit Kapoor(as Alia’s father) and Shishir Mishra(as her Pakistani father-in-law) is excellent. No, I didn’t come away from Raazi convinced that country comes ahead of familial allegiance. Neither, I felt, is the protagonist fully Sehmat (sympathetic) with that line of thought. Worse still, Alia Bhatt fails to convey Sehmat’s anguished repudiation of a spy’s double life of deception in her end-speech. It is the only time Alia is unconvincing. Perhaps because she is unconvinced. Finally she also seems to question the film’s morality. Nation first is fine. But what about the people you let down as you carry that flag up that mountain that takes you to the moral high-ground?